seafood friendly pesto…or what to do with a surplus of english peas? here at the burgeno-berman household we have a few yearly garden rituals. one being that every year at the end of march (today) we harvest what’s left in the winter/spring garden beds and prepare the triangular beds and soil for the planting of dahlia tubers. this year we were happily blessed with bowls full of tender and colorful lettuces, spicy arugula, chioggia beets (with delicious beet tops) and hearty rainbow swiss chard. however, this year the most bountiful crop by far were the plump and spring green english peas. over the past months i’ve added them raw to soups; i’ve created pasta dishes with peas as the edible focal point; i’ve blanched them for salads and grain dishes…and we’ve eaten the raw peas straight from the pods. today i experimented with creating a “pesto of sorts” with the peas. 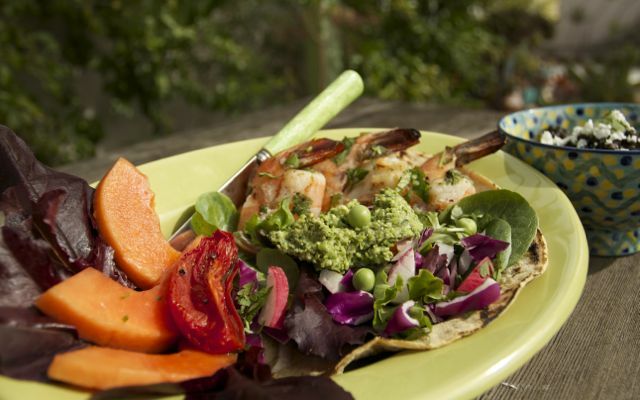 since we are having unseasonably warm weather (unlike most of the country) i thought some grilled shrimp tacos might be just the vehicle to deliver the pea/cilantro pesto to my readers…and to our dinner plates tonight! i kept the consistency rather chunky to show off the texture and color of the raw peas…and because we love texture in our food. (if you prefer a more “hummus-like” consistency, by all means add a bit of water, olive oil or vegetable broth). the ingredients are few and the prep and clean-up are VERY easy. the taste is fresh and evocative of a pesto, but with non-traditional “pesto” ingredients. though the goat milk feta is optional, i feel it gave the pea pesto just the right amount of saltiness. 1 cup shelled english peas (not frozen); 1 cup packed cilantro w/stems; 1 teaspoon red wine vinegar; 1/4 cup raw pine nuts (or unsalted nut of your choice); 1 large peeled garlic clove; 2 tablespoons goat milk feta (optional); salt to taste. puree all ingredients in a food processor…voila! told you it was simple! NOTE: the pesto would be tasty (and vibrant) on toasted baguettes; wholegrain crackers; tossed with some spinach pasta; dolloped on an egg dish; or as a seafood condiment (see above photo). i hope you will try it and let me know what you think. keep checking colormykitchen.com for blackberry recipes (going to be harvesting in a month) and, of course, for photos of the magnificent dahlias that will gracing our front yard in july/august. stonefruit “salsa” is colorful and refreshing! i think you will all agree that summer is the season for simple, healthy recipes and impromptu gatherings. taking full advantage of the vibrant seasonal fruits and vegetables and the warmer light-filled evenings lend themselves to many memorable meals shared with those we love. we experienced one such evening last week. our dear friends and neighbors of over a dozen years, the rick/destiny irons family, invited us over to their “temporary” beach house for a cocktail party and barbecue. (they are in the final stages of a major remodel of their own home.) 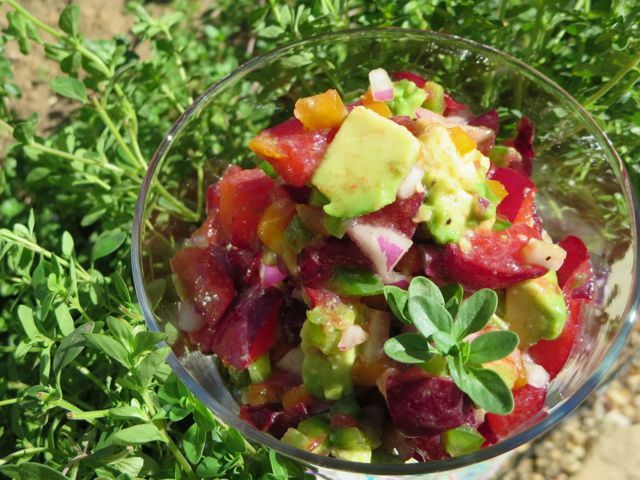 in addition to the ubiquitous cheese, olive and wine offerings, we wanted to share a colorful dish from our garden. for me, the fun and rewarding aspect of growing a prolific edible garden is “creating” something with the ripest produce we are harvesting that particular day or week. as we are still blessed with juicy, sweet/tart, ripe santa rosa plums, we decided they would be the focus of our dish. now the question begged: plum tart, pickled plums and red onions, plum compote, plum gelato or simply a bowl of fragrant plums as an offering? my daughter, domenica, and i came up with something using many of our favorite flavors, including the plums and limes from our garden. here’s another “suggestion”, not so much a recipe of how to enjoy summertime stone fruit. ingredients: 2 cups firm/ripe santa rosa plums, seeded and chopped; 1/4 cup finely diced red onion; 1/4 cup finely diced yellow or orange bell pepper; 1 jalapeño or serano chile, tiny dice (membranes and seeds removed for less heat); 1 large firm/ripe avocado, diced; 2 tablespoons freshly squeezed lime juice. mix fruit, onion, peppers and chile together, gently fold in chopped avocado, lime juice and salt/pepper to taste. not many ingredients! definitely quick and healthy! immensely flavorful! try it yourself with: grilled pork tenderloin, roasted/herbed tofu, over chicken enchiladas with a tomatillo salsa, as a side to seared scallops, a topping for grilled fish tacos, or simply as a salsa with some hearty chips. that evening we shared many stories, laughs and memories. over the course of the cocktail hour the plum “salsa” disappeared and was touted as a successful “creation”. p.s. next post: four varieties of cherry tomatoes…my favorite! 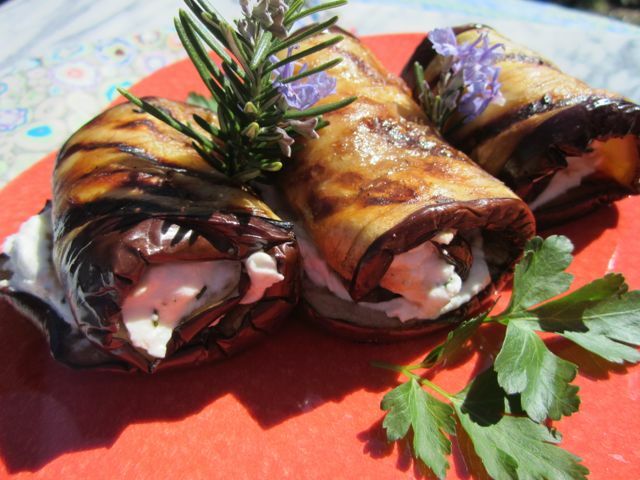 herbed goat cheese rolled into grilled eggplant…impressive yet easy! 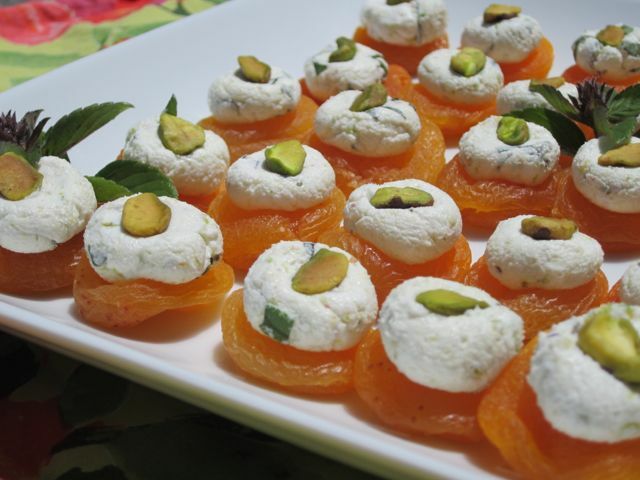 delicious and easy to make appetizer! garnish with extra basil leaves if desired.